A little over three weeks after being released to the public, iOS 11 adoption has reached its 47 percent, successfully overtaking iOS 10, according to data collected by analytics company Mixpanel. With iOS 11 installed on 47 percent of devices, iOS 10 is now installed on 46 percent of devices. 6.7 percent of devices also continue to run iOS 9 or earlier. iOS 11 adoption has been much slower than iOS 10 adoption during the same timeframe last year. 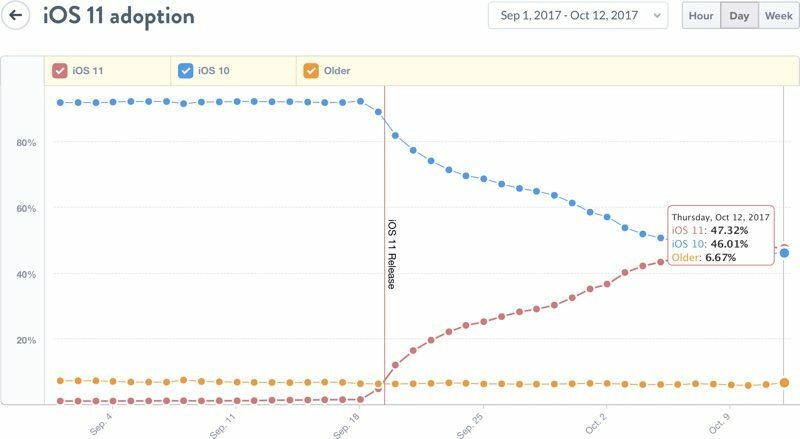 It took just two weeks for iOS 10 to overtake iOS 9, while iOS 11 was only installed on 38.5 percent of devices at the two week mark. Adoption rates have been steadily increasing, though. At 24 hours, iOS 11 was installed on 10 percent of devices, and at one week, it was installed on 25 percent. Apple has released three minor updates to iOS 11 so far to fix bugs and issues discovered since its launch. The most recent update, iOS 11.0.3, came out just yesterday. The first major update to iOS 11, iOS 11.1, is in the works and that update may spur people running iOS 10 to upgrade to iOS 11. iOS 11.1 introduces new emoji characters, often popular with users, and it reintroduces a 3D Touch gesture that lets the App Switcher be accessed with one hand. I'm part of the proud 53%. In about 30 years of owning and using Apple products, this marks the first time I've elected not to do software upgrade. This is not the Apple I grew up with. And it's not the company that transformed itself starting around the mid 2000s either. I'm not blaming Tim Cook like lots of people on here do. But I am no longer the Apple enthusiast and evangelist I once was. No wonder. I erased the download from my parents iPad, and I hoped the iPad would learn that erasing the download would be understood by the iPad as a clear message in the lines of "thanks but I don't want to update". However, Apple is pushing hard these days, very hard, in a really annoying way, so annoying that their products are not user-friendly anymore, but Apple-friendly, or CEO-friendly, or, actually, life-control-friendly. Today, my parents (who are elderly) inadvertently accepted a dialog for updating to iOS 11, and here we go, a new iPad updated to iOS 11... some 32 bit apps that were useful no longer work, the iPad now is very pushing to activate Touch ID, a password, Apple Pay, etc... (I had to repeat TWICE that I do NOT want Touch ID nor a password, nor iCloud, nor NOTHING, and I'm afraid the iPad will ask me again about that... maybe someday it will require you to accept its blackmail for it to work). Apple is doing exactly (and I mean exactly, and let me insist: exactly) the same things why I considered Microsoft user-unfriendly and that made me switch from PC to Mac decades ago. And then you have the fanboys who tell you "if you need to use 32 bit apps, very easy: don't update to iOS 11". Really? Are you joking? How on Earth can you configure your iPad so that elderly people won't get confused and install iOS 11 by mistake when Apple is pushing hard to do whatever the CEO wants? It's not the first time I realize about this, but today I see it really clear: Maybe I'll continue using Apple-derived technology in the future, because I'm a UNIX user/developer, and because I want products that work out of the box. But I'm almost sure now that I won't be using Apple-genuine products in the future, but Apple-derived ones. Apple: You really trashed everything good that you used to have. Apple should just automatically update everyone. They nag you until you do it anyways. Ill wait for further revisions. And Android Oreo, released a month earlier, sits at 0.2% adoption. Who gives a damn about these BS stats??? You can't revert to a previous version if you wanted to!! I wonder what percentage of those on iOS 11 wish they weren't. Everyone I know that has switched over has complained about poor battery life and slowdowns of the OS. Until they can fix those problems I'll be sticking with nice stable iOS 10 on my 6S.